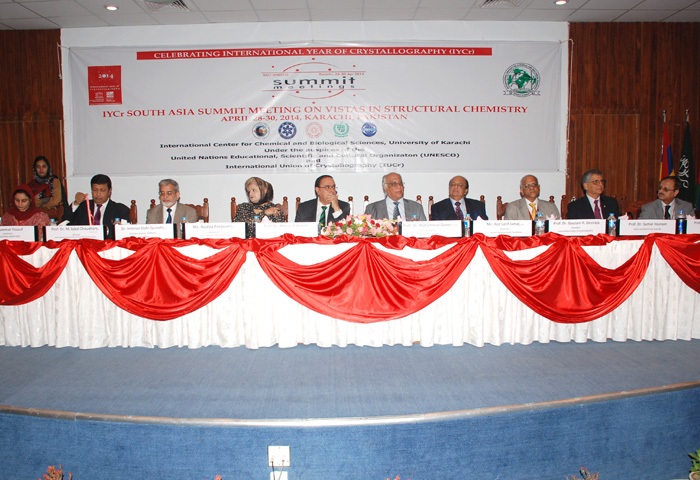 From 28th to 30th April 2014, the ‘IYCr2014 South Asia Summit Meeting on Vistas in Structural Chemistry’ was organized at COMSATS’ Centre of Excellence in Karachi, Pakistan, the International Center for Chemical and Biological Sciences (ICCBS). Held under the auspices of the International Union for Crystallography (IUCr) and UNESCO, this was one of the three Summit Meetings, being held in connection with the International Year of Crystallography (IYCr2014). The Commission on Science and Technology for Sustainable Development in the South (COMSATS); Ministry of Science and Technology (MoST), Government of Pakistan; Pakistan Academy of Sciences (PAS); Chinese Academy of Sciences (CAS); and Indian National Science Academy (INSA), provided support for organization of the event in Karachi. The 2nd and 3rd Summit Meetings will take place in September (Brazil) and October (South Africa) this year. 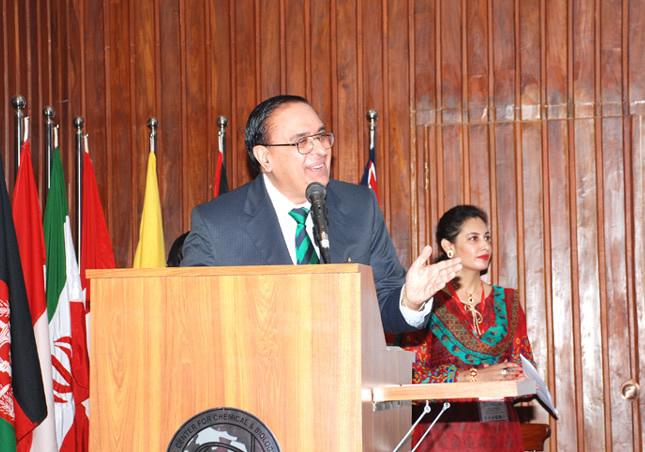 The three-day event was inaugurated by Dr. Mukhtar Ahmed, Chairman Higher Education Commission (HEC) of Pakistan. Other distinguished guests attending the ceremony included: Prof. Dr. Gautam R. Desiraju, President IUCr; Prof. Dr. Atta-ur-Rahman, President Pakistan Academy of Sciences; Dr. Imtinan Elahi Qureshi, Executive Director COMSATS; and Chairman Organizing Committee IYCr2014; Ms. Nadira Panjwani, the Founder and Managing Trustee of the Panjwani Charitable Foundation and Trusts; Prof. Dr. M. Qaiser, Vice Chancellor University of Karachi; Mr. Aziz Latif Jamal, Husein Ebrahim Jamal (HEJ) Foundation; Prof. Dr. Iqbal Choudhary, Director, ICCBS; and Prof. Dr. Samar S. Hasnain, Editor-in-Chief of IUCr Journals. In his inaugural address delivered via video-conferencing, the Chairman HEC said that it is important for the developing countries to learn from each other. He pledged his organization’s support to provide a platform for conducting regional conferences, workshops and seminars in different areas of interest. He said that he would be looking forward to the proceedings of the event in order to formulate an effective Medium Term Development Framework for HEC. In his remarks on the occasion, Dr. Choudhary lauded the efforts of Prof. Dr. Atta-ur-Rahman and Prof. Dr. Desiraju for organizing the event, and gave a brief introduction to the format of the meeting. Dr. Choudhary informed that ICCBS procured its first modern X-ray crystallography equipment in the 1980s and since then many laboratories have emerged in the Pakistan with advanced applications in structural chemistry, biology and drug discovery. Prof. Dr. Hasnain recalled the efforts of Late Prof. Saleem-uz-Zaman Siddiqui in establishing the Postgraduate Institute of Chemistry at the University of Karachi, Pakistan. He noted that in today’s world where international relations are experiencing a quantum shift, Science has an even more vital role to play in the global cooperative activities and diplomacy. In her message read out on the occasion, the Director General UNESCO, D r. Irina Bokova, called for stronger partnerships among Asian economies to contribute to the post-2015 development agenda debate. Considering large-scale brain drain, a challenge especially for the developing world, Dr. Bokova asserted that the developing countries need to build a critical mass of people in science and technology for them to be able to exploit the full potential of science. 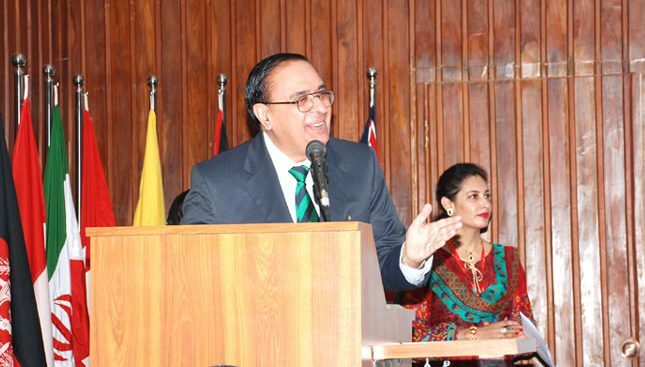 Dr. Atta-ur-Rahman in his address said that the IYCr2014 Summit was a unique event due to the participation of Indian National Science Academy (INSA) for the first time. Also noting the participation of Chinese Academy of Sciences (CAS) in the event, he believed that the event would give the participating scientists an excellent opportunity to develop regional collaboration and linkages in the field of Crystallography. He informed that a possibility of an open access lecturing programme and open access instrumentation to facilitate scientists and students in the region to share relevant resources has been discussed with the Executive Director TWAS. Speaking on the occasion, Dr. I. E. Qureshi, Executive Director COMSATS, said he was impressed by the strong participation at the IYCr2014 by the Pakistani, Indian, Chinese and Sri Lankan academies of sciences. He said that COMSATS’ partnership in the event was based on the fact that it was an intergovernmental organization dedicated to South-South Cooperation in Science and that ICCBS is one of the affiliated Centres of Excellence of the COMSATS’ Network. The South Asian Summit had participation of 380 senior scientists, researchers and scholars hailing from 22 countries, including Bangladesh, Cameroon, China, Egypt, France, Germany, India, Iran, Jordan, Malaysia, Nepal, Nigeria, Saudi Arabia, Sri Lanka, Sudan, Sweden, Turkey, United Kingdom, United States of America, and Yemen. The Summit Meeting provided a platform to the scientists, mainly from the countries of the South Asian region, to share their findings with science administrators and industry representatives in order to develop a greater understanding about the tremendous benefits of structural chemistry. During the nine Technical and five Panel Discussion sessions, the speakers and panelists highlighted the significance of crystallography; explored current advances and frontiers in structural biology; and illustrated how high-throughput approaches in Crystallography in combination with hybrid methods using computational and other biophysical techniques can be used to tackle topical and challenging problems in molecular, cellular and chemical biology. The technical sessions were followed by Panel Discussion sessions touching upon the basics, properties, R&D related issues, future possibilities, as well as regional cooperative prospects in Crystallography. During the three-day event, the participants of the meeting were also shown around the state-of-the-art laboratories of ICCBS. On April 30, 2014, the Summit Meeting concluded on the note of making extensive regional and international cooperation in the field of X-ray diffraction, crystallography, drug design and discovery, in line with the objectives of the International Year of Crystallography. The concluding ceremony of the event was presided over by Prof. Dr. Atta-ur-Rahman, while the President IUCr, Prof. Dr. Gautam R. Desiraju, presented a vote of thanks on behalf of the organizers. During the ceremony, a letter signed by all the local and international participants was handed over to Prof. Dr. Desiraju, seeking his organization’s support for initiating actions to promote regional scientific collaboration through holding of joint training workshops and video-based lectures; encourage mobility of researchers; promote joint research projects in crystallography; leverage national bodies and institutions through financial support; and facilitate regional conferences on the subject of X-Ray diffraction and its applications in South Asian and South East Asian regions.